Home » Featured » Winner alright, that Saturday night! Winner alright, that Saturday night! Saturday night, December 22, was a night of excitement at the famous The Sallynoggin Inn. The inimitable Johnny Peters was on stage with his Joe Dolan Tribute Show, the Cabinteely FC Volunteers and Friends were having a well-earned night out and there was money to be won! Speaking after the draw, Cabinteely FC Board Chairman, Larry Bass, thanked everyone who bought or sold draw tickets. “The support we receive within the club as well as from our families, volunteers and sponsors is vital in fielding our 58 teams on a weekly basis. The money raised from our Christmas Draw will go towards the continued development of players and facilities at the club”. Cabinteely’s first game in the SSE Airtricity League of Ireland 2019 will be an East Coast derby versus neighbours, Bray Wanderers FC, in Stradbrook on Friday, February 22, with a 7.45pm kick-off. The fixtures for our underage National League teams, U-15, U-17, U-19 and, this season, U-13, will be announced in the coming days. Meanwhile the boys and girls of the club’s juvenile teams are readying themselves for their new season which will get underway from mid-February. Boots are being dusted off now and Cabo players at all levels will grace the fields of Stradbrook, Ballycorus, Kilbogget and many more venues over the next ten months or so. For any further detail contact Pat Costello, General Manager on 086 831 8000 or by email. 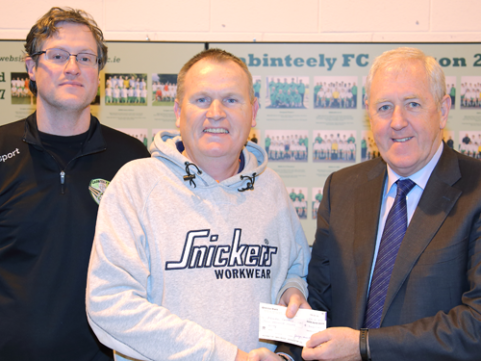 Pictured above at the presentation of the winning cheque are (l to r): Shane Trappe, Cabinteely FC Administration, prizewinner Martin Collins and Pat Costello, General Manager, Cabinteely FC. Well, that must have been a great Christmas for our winners!